As usual, the message is cryptic. "We still have a lot to cover" might simply mean there are a lot of announcements to come. Some predict some kind of keyboard cover for the iPad. I'm wondering, though, if this might be referring to a new feature for the covers of the MacBook; Apple has filed plenty of patents in this area over the last few years. Or who knows, maybe it'll be a smart porkpie hat, in honor of Breaking Bad. New iPad and iPad mini: Count on it. We're due for an update. I don't think there'll be anything revolutionary in the larger iPad; we'll probably see an A7 or A7X processor, a slightly smaller overall size (but the same screen size), improved battery life, and a fingerprint sensor. The smaller one will probably get a Retina display, but we may still see a non-Retina mini as a lower-cost option. Will we get a keyboard cover that turns the iPad into a tablet-laptop hybrid? I kind of think not, because it's hard to have a single OS that handles both touch and non-touch input gracefully (see: Windows 8). I also don't think a simple keyboard cover is enough to be the emphasis of a press event. New MacBook Pro: Count on it. We're overdue for Haswell-powered MacBook Pro laptops with Intel Iris Pro graphics. It's quite possible we'll go all-Retina, too, and no more optical drives. Or maybe Apple will retain one non-Retina model for the holdouts, but it'll be de-emphasized. I think we might have some kind of innovation in the case or form factor. OS X Mavericks and Mac Pro Release Date: Highly probable, though perhaps they'll lose out on the competition for stage time. I think both will be available within weeks or even days. I also think we're in for an unpleasant surprise about the Mac Pro price, given the high-end specs. New Apple TV: Questionable. Apple has already made some moves in the content area, but nothing that screams for a new hardware product. We might see a slight spec bump in hardware and a new software release. There may well be an announcement about third-party apps, but that would make more sense for WWDC than an October press event. I'm wildly hopeful for a big announcement that will let me get rid of my cable set-top box, but I think odds are fairly low. iPod updates: Doubtful. The iPod Touch got new color options last month; the other products aren't getting much R&D attention, so unless they retire the Classic and surprise us with a high-capacity replacement product (128- or 256-GB flash-based iPod Touch? ), I don't think there'll be anything to announce here. Watch or wearable device: Doubtful. 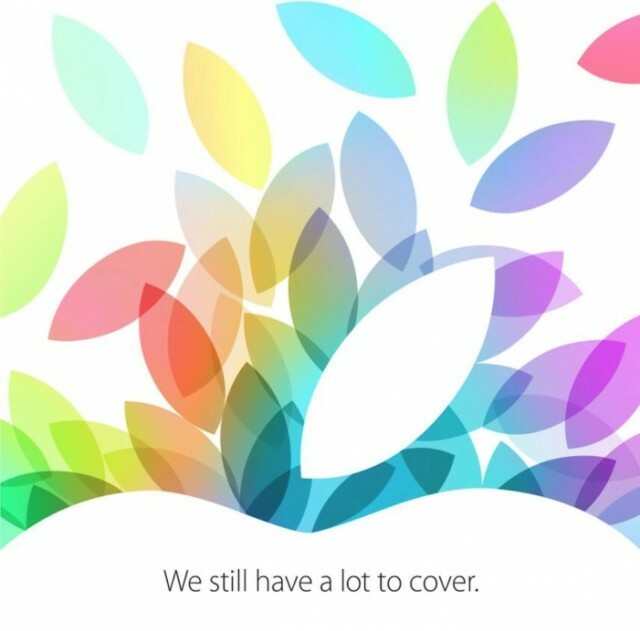 If Apple were introducing a watch, it'd be the star of the show, and the teaser would reference "time" in some way. I don't think we'll see Apple-based eyewear either... that market simply isn't there yet. The event begins at 10:00 AM PST tomorrow. You can find live coverage at the usual places (Engadget, Gizmodo), and I'll try to cover the highlights afterwards.